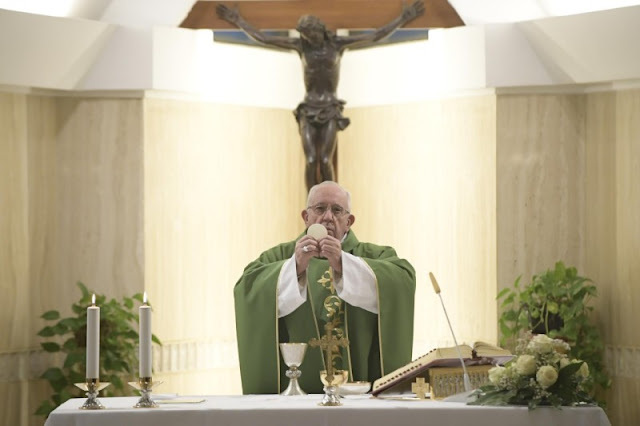 The Pope said, “It is during a moment of internal persecution and inner state of the soul that the author of the Letter to the Hebrews urges Christians to perseverance". “You need endurance to do the will of God and receive what he has promised.” One needs perseverance to reach the promise. Pope Francis then focused on two things, or a recipe, that help us fight desolation: memory and hope. Like the apostle, he pointed out that one must first of all recall the beautiful moments, the happy days of our encounter with the Lord, the time of love. And, secondly, we must have hope for what has been promised us. With life consisting of good and bad times, the Pontiff said it is important not to "allow oneself to fall" and "go back" in moments of difficulty. The Pope urged Christians not to give in to bad times, urging them to endure in memory and hope - an endurance of the heart which, he said, recalls good times and "breathes when looking up to hope". Finding the consolation of the promise of the Lord is what we must do in moments of desolation, the Pope said. The Pope noted that even today, many men and women suffer for their faith but remember the first encounter with Jesus and gain hope and go ahead. “Perseverance”, the Pope said, “is the advice of the author of the Letter to the Hebrews to Christians in times of persecution and attacks. The Holy Father urged Christians to always look to the Lord when the devil attacks us with temptations. With our miseries, he said, we must always look to the Lord, have "the perseverance of the Cross recalling the first beautiful moments of love, of our encounter with the Lord and the hope that awaits us.